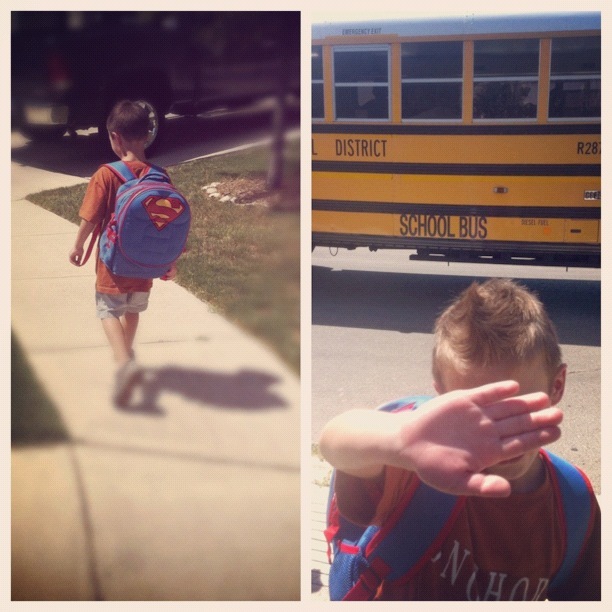 This was Asher the first day he rode the bus home from school. Our entire family walked to the bus stop to get him. I don't know why I expected him to jump off, run to me and give me a gigantic hug. Instead he was totally embarrassed. We have some neighbors who also take the bus and walk home so he wanted to walk with them. apparently our being there was totally cramping his style. I might have been totally hurt, but I know Asher. And even though I can see him growing up into this big kid who is too cool for school, I know who he is inside. And inside he loves his mama like no other. Inside he is still the little boy who begs to sleep with me each night, and attacks me with hugs and kisses. Inside, he'll always be that tiny little first born who stole my heart forever. So this picture makes me smile more than anything. I am so glad I caught it and didn't delete it. It's not perfection in the sense of what I had envisioned, but it's perfect for showing the stage and time we are in. I'm learning how to be a mom to a "kid"
...not a baby, toddler, or pre-schooler. It's a different story for sure, but one I am loving too. People say to enjoy them while they are babies because they grow up so fast. I totally get that. I agree with it. But growing up isn't a bad thing either, you know? It's all what you make of it. And I could very well be crying over this new stage and time, because he is clearly not my baby anymore. But instead I'm embracing this new phase as a mom. There is plenty to cherish right here and now too. When I get to watch him sitting at the table after school, doing his homework and eating a snack...it's almost like the first time I held him, or watching him take his first steps, or when he lost his first tooth. That is so awesome... how you went with it and loved the moment anyway. lol I love it! That has happened to be several times with my boys. But I like what you said " growing up isn't a bad thing either." That's so true. They do grow up fast but the good part of that is that we get to see them grow into the person we are raising them to be. Loving, kind, thoughtful and most important of all followers of Christ. I can't wait to see all my 4 boys grown men of God. :)Have a wonderful and blessed week Laura! first of all, coolest name ever mom! i love that name asher! i think this stage of human development is such a beautiful and precious one. they are getting a sense of independence and they are getting embarrassed...so cute! but that situation is too funny, you go mom! keep hold of his childhood as long as you can! i pray that little asher will be a light to his schoolmates and that he would be a blessing even as young as he is. i have a hard time as my children continue to get older and older on me:) But my hubby gently reminds me that their development is a sign of God's goodness. Just trying to soak up every moment with them.